PERFECT ACTIVITY TO USE FOR A SUBSTITUTE TEACHER!!! Students love watching these amazing videos of how America developed over time and these worksheets will hold students accountable. 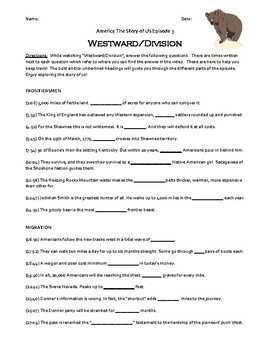 This is a two page video question worksheet for America The Story of Us Episode 3: Westward/Division. The video is available online on Amazon and in other formats such as DVD. 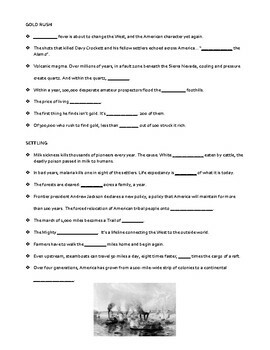 This unique differentiated question worksheet comes with two versions: one with time indicators where each answer can be found and one without. 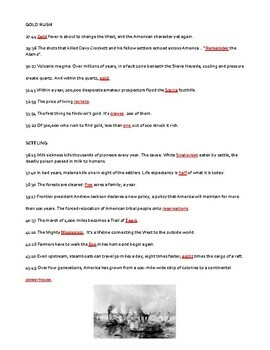 The time indicators are super helpful for students who may struggle with attention, pace, spelling, etc... Each worksheet also comes with bold headings and sometimes underlined subheadings that help students follow along and keep up with the video. This product will be available to be purchased in a BUNDLE at a discounted price soon! 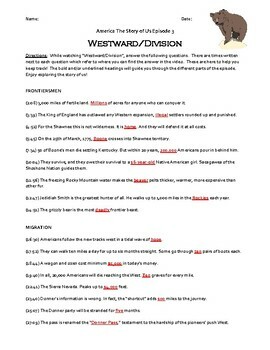 The remaining video worksheets are continuing to be made and will be posted shortly.